ELIXIR > Promotions > Competition givaway – 3 samples of Grahams Calendulis Plus cream worth £13.95 – Now closed! 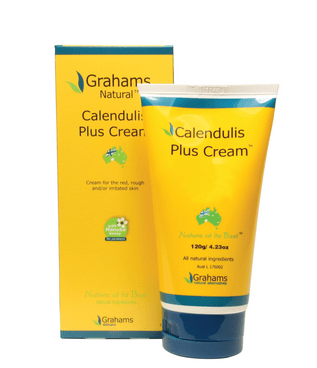 Competition givaway – 3 samples of Grahams Calendulis Plus cream worth £13.95 – Now closed! Australia’s best-selling natural skincare range of top-to-toe treatments for eczema and sensitive skin conditions was founded from a fathers’ desire to ensure his son did not have to suffer from the debilitating physical and psychological effects of severe eczema, as he had done. Grahams Calendulis Plus Cream, contains calendula extract, manuka honey and emu oil which all have superior anti-inflammatory, anti-bacterial and hydrating benefits to nourish and soothe red and inflamed skin and also promote quick healing. It should be applied 2 or 3 times a day to restore the skin’s protective layer and maximise the skin’s moisture levels. Stockists: www.vital-life.org.uk, Grahams Calendulis Plus Cream is £13.95 for 50g. This entry was posted in Promotions and tagged calendula, eczema, emu oil, flakey skin, manuka honey, skin by admin. Bookmark the permalink.